Presentation on MHESAC and SAF January 2007 Student Assistance Foundation. 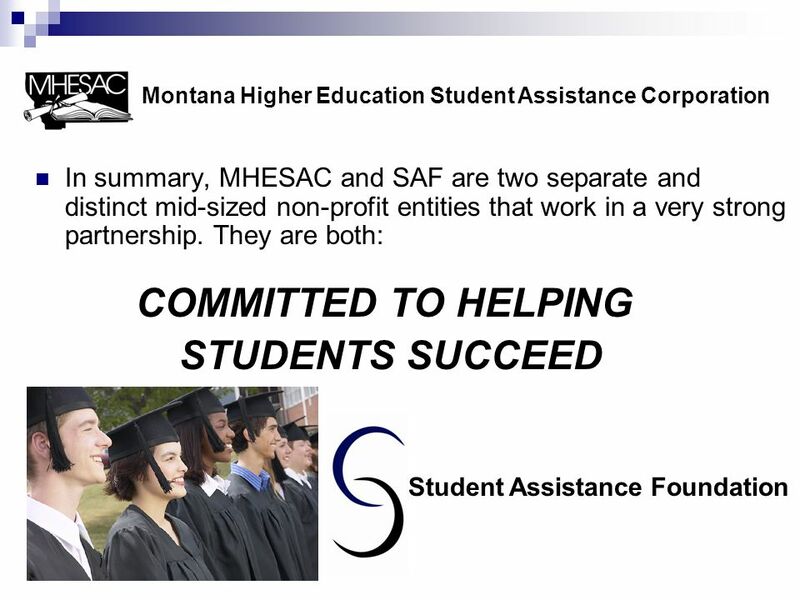 3 Montana Higher Education Student Assistance Corporation (MHESAC) MHESAC is a Montana not-for-profit corporation organized under Section 150(d) of the U.S. Tax Code in 1980. MHESAC is governed by a seven member Board of Directors. 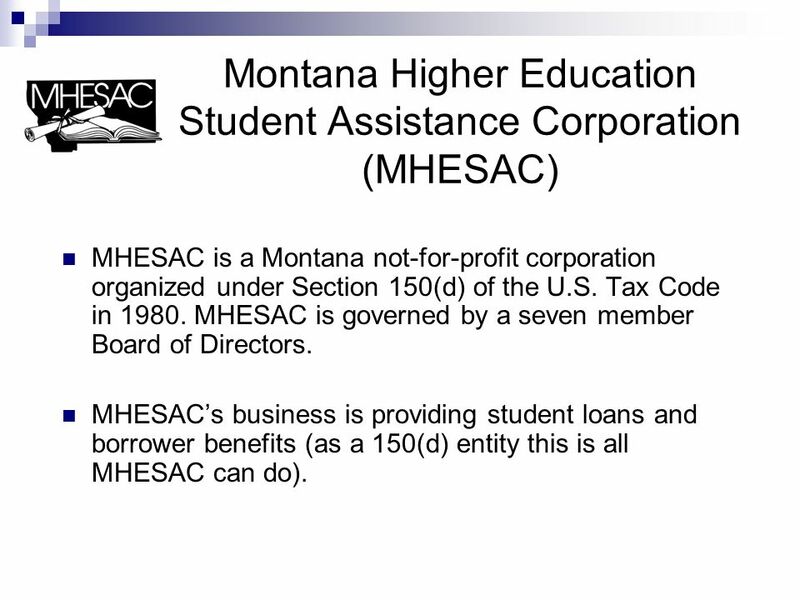 MHESAC’s business is providing student loans and borrower benefits (as a 150(d) entity this is all MHESAC can do). 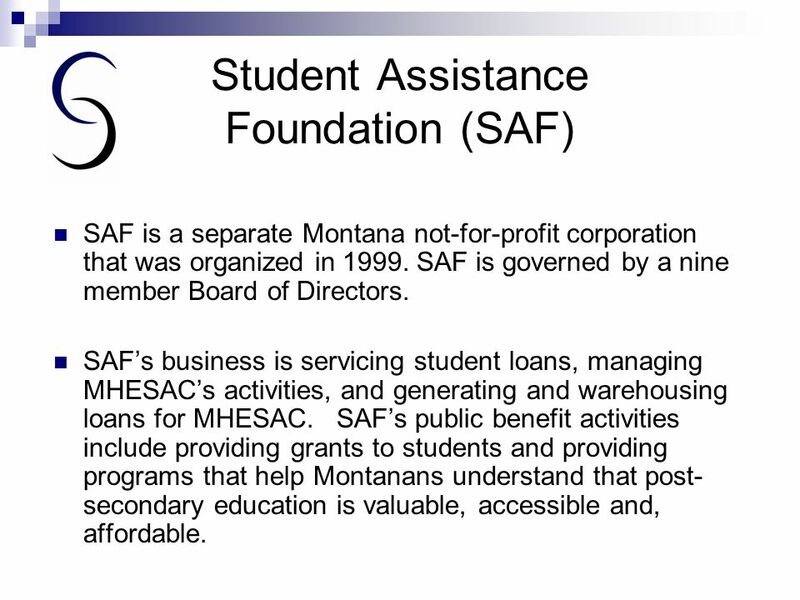 4 Student Assistance Foundation (SAF) SAF is a separate Montana not-for-profit corporation that was organized in 1999. SAF is governed by a nine member Board of Directors. 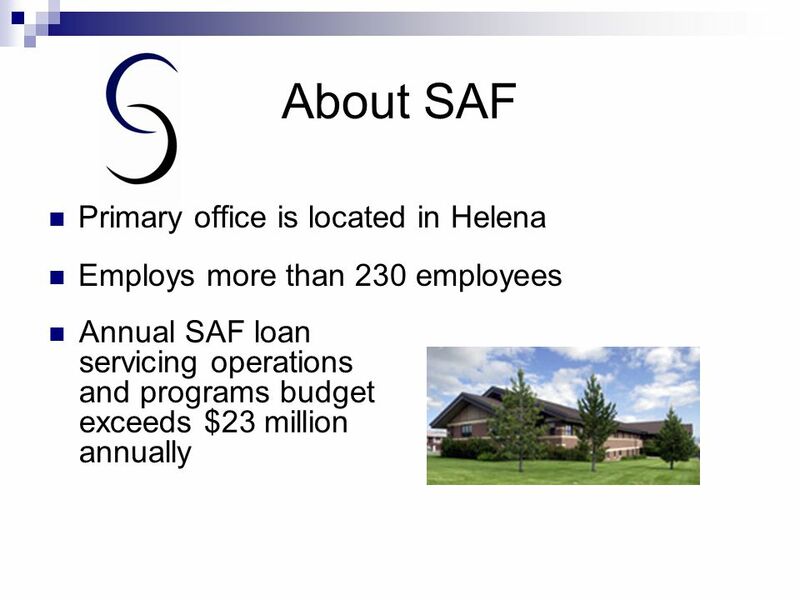 SAF’s business is servicing student loans, managing MHESAC’s activities, and generating and warehousing loans for MHESAC. 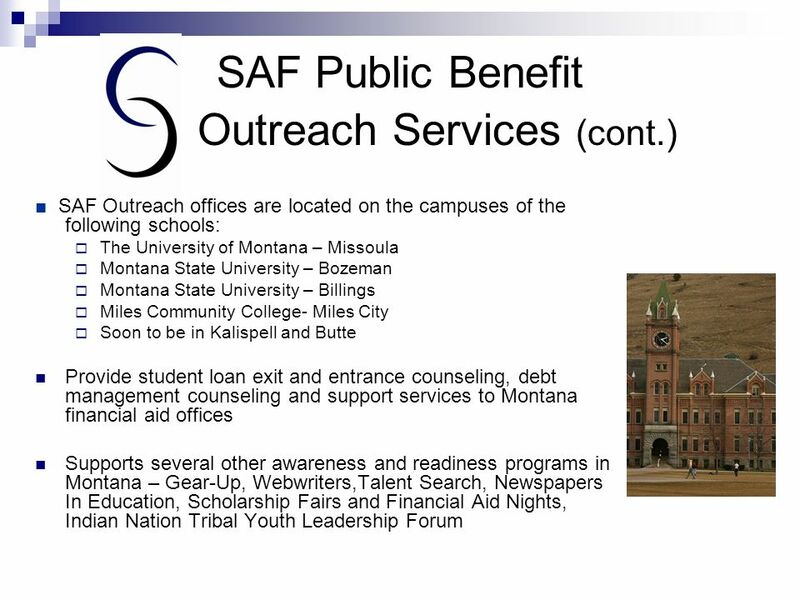 SAF’s public benefit activities include providing grants to students and providing programs that help Montanans understand that post- secondary education is valuable, accessible and, affordable. 6 MHESAC (cont.) 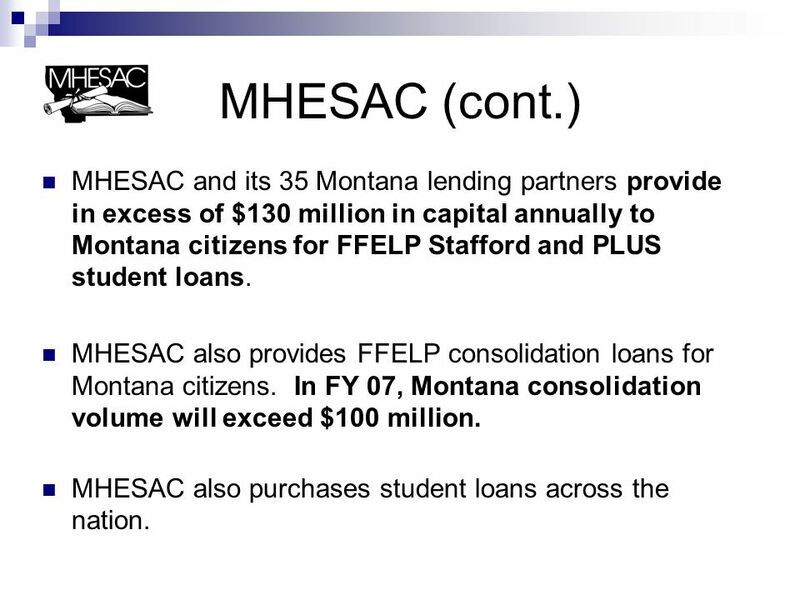 MHESAC and its 35 Montana lending partners provide in excess of $130 million in capital annually to Montana citizens for FFELP Stafford and PLUS student loans. 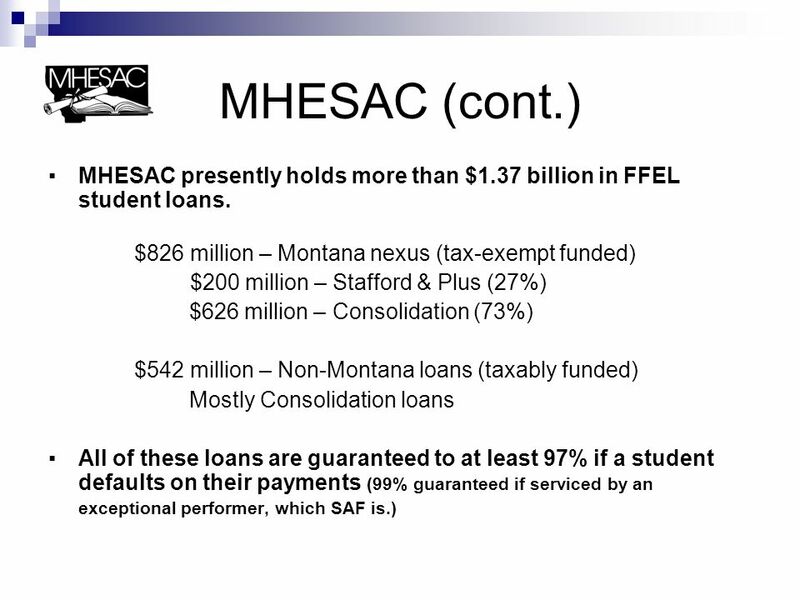 MHESAC also provides FFELP consolidation loans for Montana citizens. In FY 07, Montana consolidation volume will exceed $100 million. MHESAC also purchases student loans across the nation. 8 MHESAC (cont.) On tax-exempt funded loans all earnings on the loans above a 2% spread must be returned to federal government or returned to borrowers. 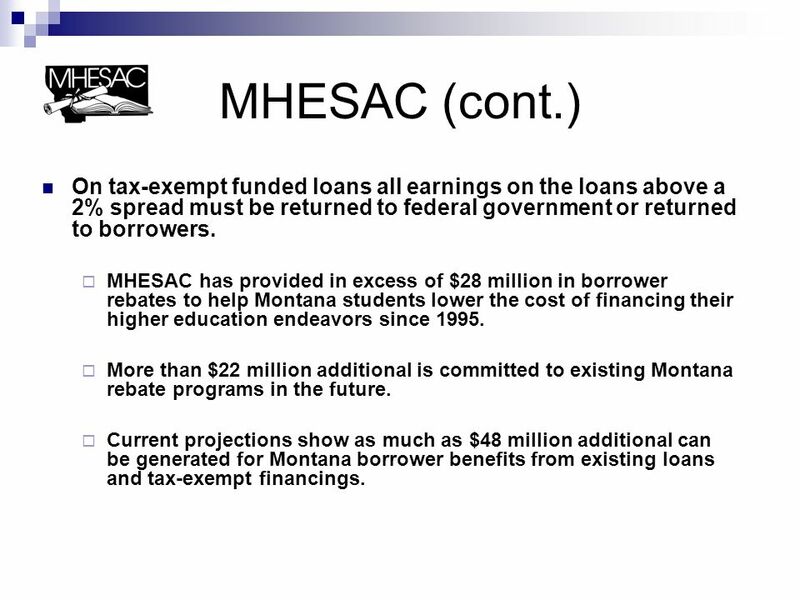  MHESAC has provided in excess of $28 million in borrower rebates to help Montana students lower the cost of financing their higher education endeavors since 1995.  More than $22 million additional is committed to existing Montana rebate programs in the future.  Current projections show as much as $48 million additional can be generated for Montana borrower benefits from existing loans and tax-exempt financings. 9 MHESAC (cont.) 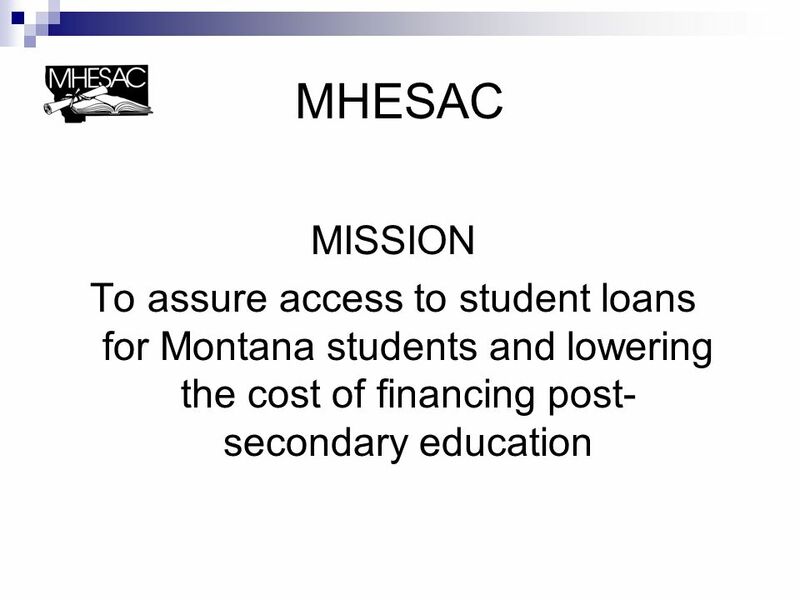 In 2000, MHESAC commenced student loan activity outside of Montana. 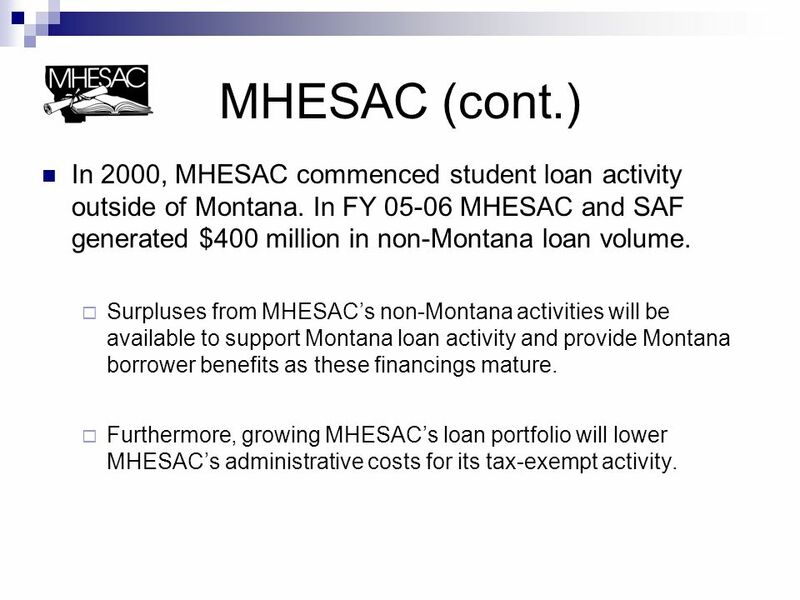 In FY 05-06 MHESAC and SAF generated $400 million in non-Montana loan volume. 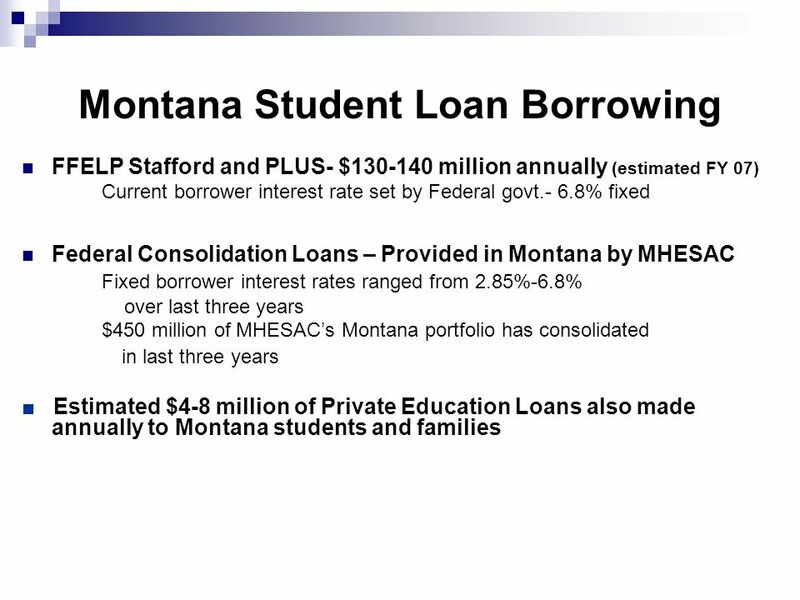  Surpluses from MHESAC’s non-Montana activities will be available to support Montana loan activity and provide Montana borrower benefits as these financings mature.  Furthermore, growing MHESAC’s loan portfolio will lower MHESAC’s administrative costs for its tax-exempt activity. 10 MHESAC (cont.)  MHESAC is not a part of state government and receives no state monies. 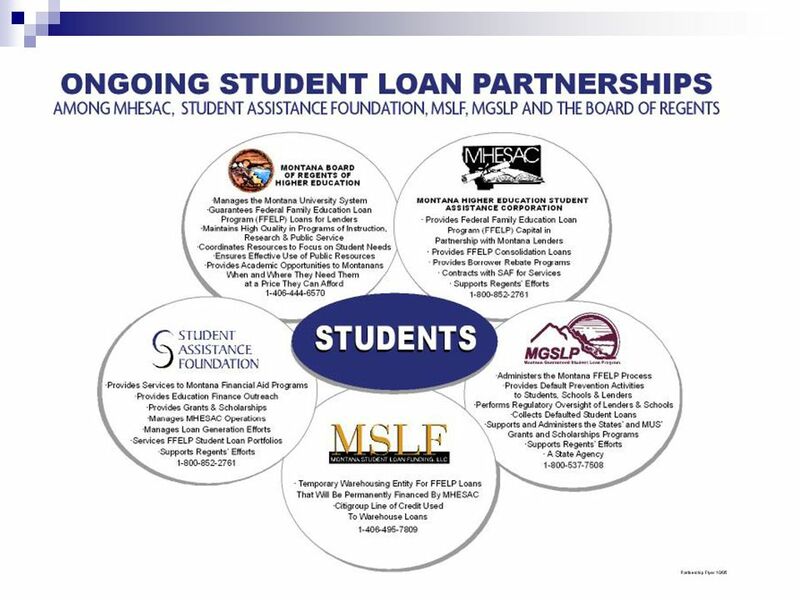 All of MHESAC’s revenue is generated by the assets associated with its student loan financings. 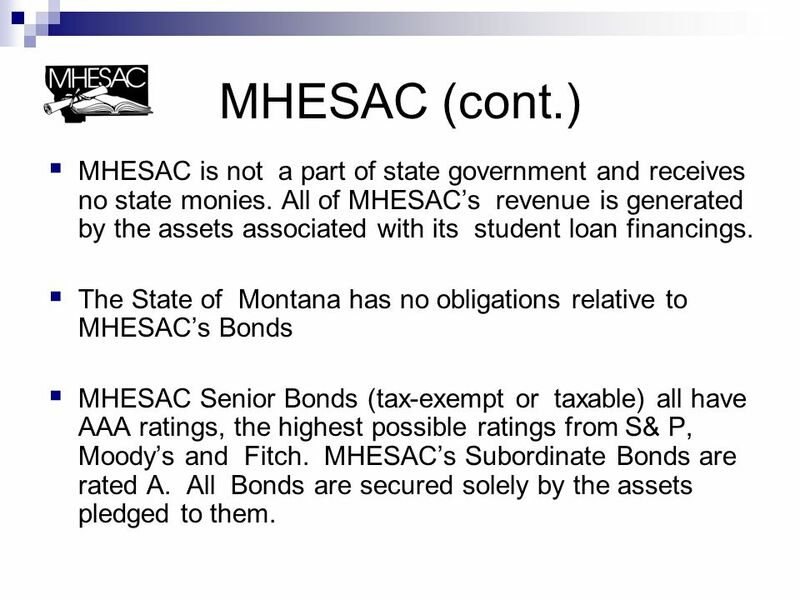  The State of Montana has no obligations relative to MHESAC’s Bonds  MHESAC Senior Bonds (tax-exempt or taxable) all have AAA ratings, the highest possible ratings from S& P, Moody’s and Fitch. MHESAC’s Subordinate Bonds are rated A. All Bonds are secured solely by the assets pledged to them. 11 MHESAC (cont.) Since 1983, MHESAC has helped more than 110,000 Montana citizens pursue their post-secondary education dreams. 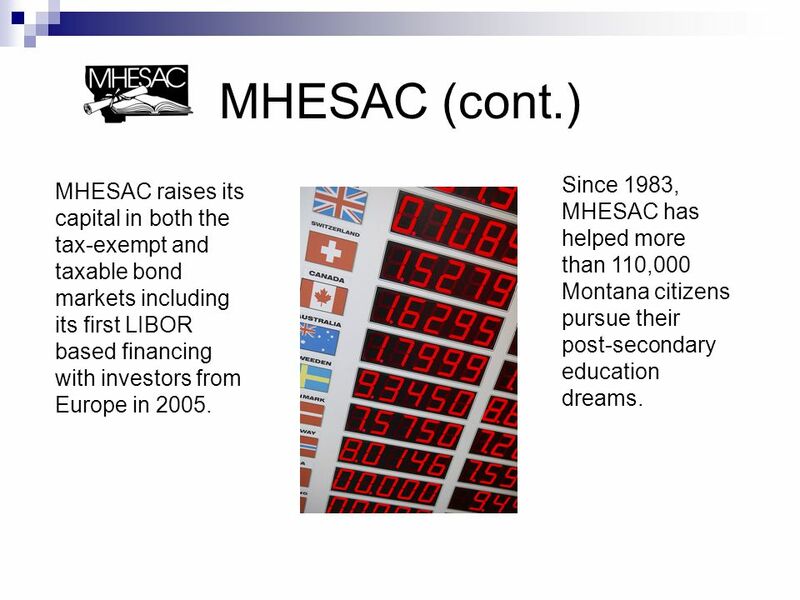 MHESAC raises its capital in both the tax-exempt and taxable bond markets including its first LIBOR based financing with investors from Europe in 2005. 12 Student Assistance Foundation MISSION To provide students with the knowledge and tools to finance and pursue their post-secondary education. 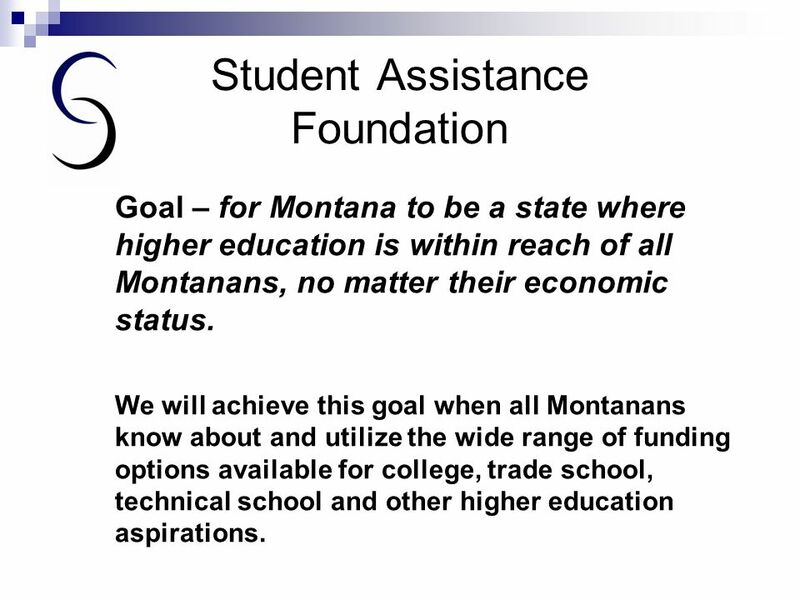 13 Student Assistance Foundation Goal – for Montana to be a state where higher education is within reach of all Montanans, no matter their economic status. 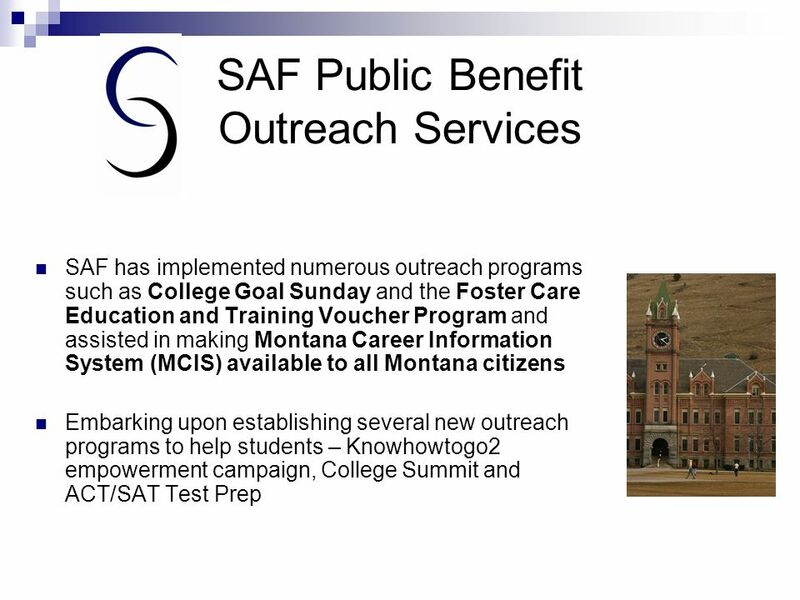 We will achieve this goal when all Montanans know about and utilize the wide range of funding options available for college, trade school, technical school and other higher education aspirations. 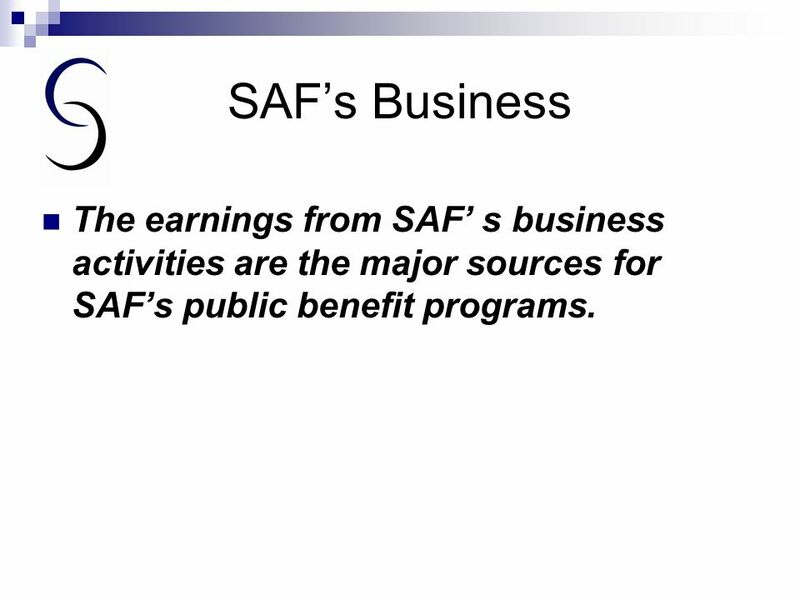 14 SAF’s Business The earnings from SAF’ s business activities are the major sources for SAF’s public benefit programs. 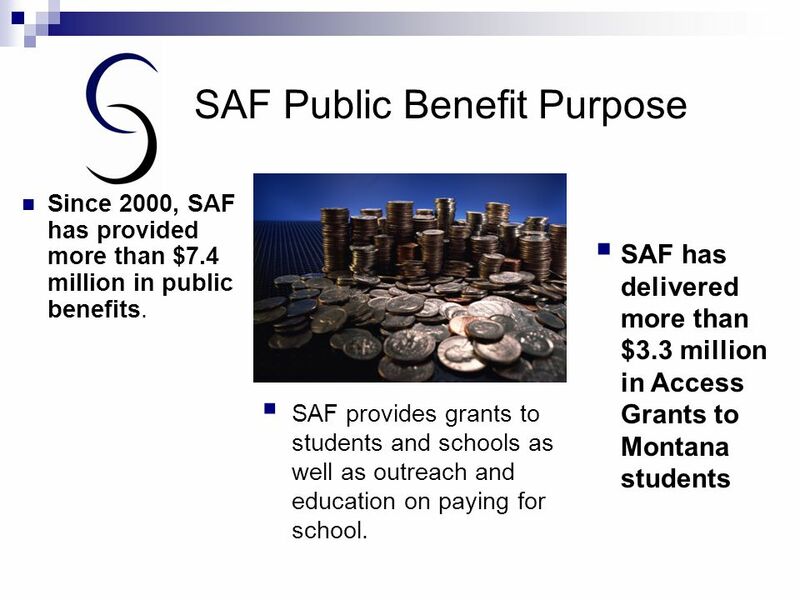 16 SAF Public Benefit Purpose  SAF provides grants to students and schools as well as outreach and education on paying for school. 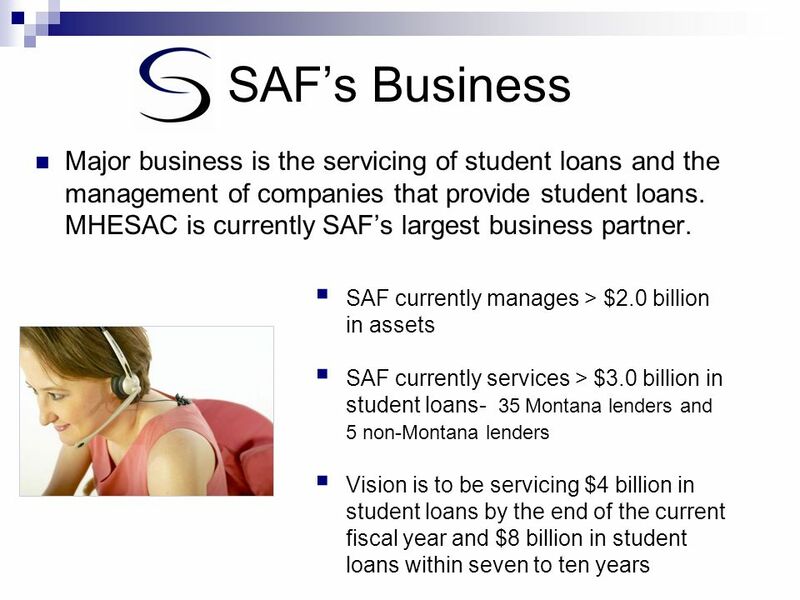  SAF has delivered more than $3.3 million in Access Grants to Montana students Since 2000, SAF has provided more than $7.4 million in public benefits. 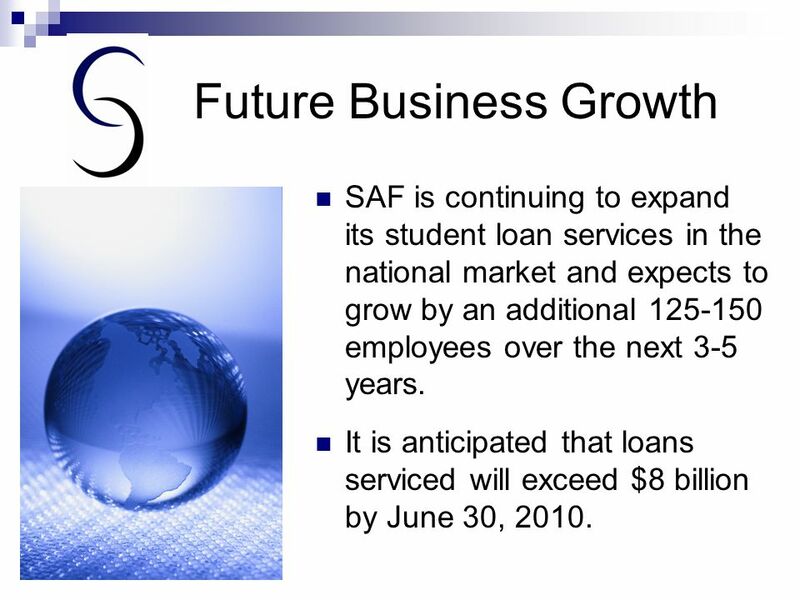 20 Future Business Growth SAF is continuing to expand its student loan services in the national market and expects to grow by an additional 125-150 employees over the next 3-5 years. It is anticipated that loans serviced will exceed $8 billion by June 30, 2010. 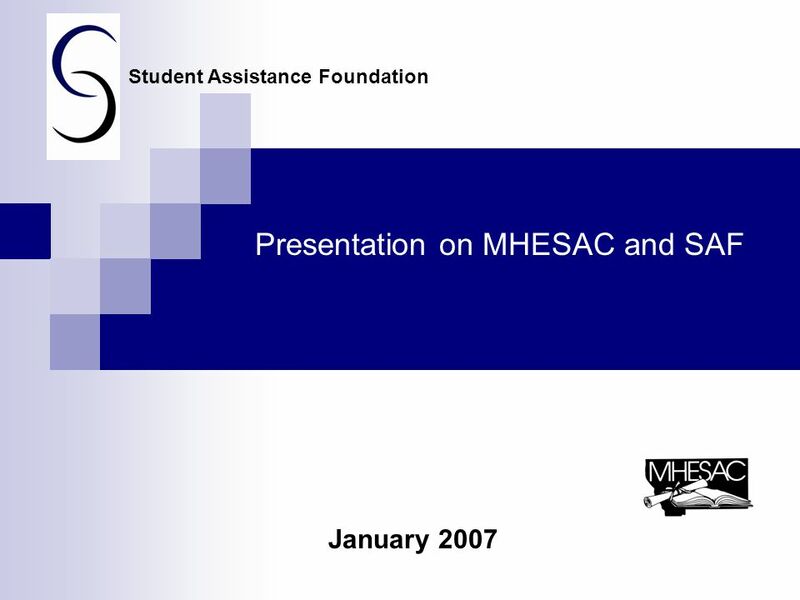 Download ppt "Presentation on MHESAC and SAF January 2007 Student Assistance Foundation." TRENDS IN HIGHER EDUCATION SERIES 2008 TRENDS IN Student Aid. Government Spending Daniel Camit Derrik Overton Kevin Phipps Billy Raddell. The Canadian Experience with Income Trusts. Outline What are income trusts? Tax policy implications Experience in selected countries Revenue implications. Financial Aid: An Informational Tool for Middle School Students and Families. Mike Johnson, Director of Financial Aid Pacific University. Paying for College Financial Aid Overview. College Expenses Tuition & Fees Room & Board Books & Supplies Transportation Miscellaneous Personal Expenses. January 10, 2007Presented by A. Rounce1 Post-Secondary Education in Saskatchewan Presented to the Citizen Consensus Forum in Regina, SK – Jan. 10, 2007. February 2014 Social Enterprise Northwest Social Finance Fair. 2009 American Recovery & Reinvestment Act SBA Update. Healthy Futures Fund Goals 2  PROVIDE NEW CAPITAL to Federally Qualified Health Centers (FQHCs) at a time of significant patient growth  ENCOURAGE COMMUNITY. By Sean Hutchens and Jun Park.  Municipal Bonds  History of Municipal Bonds  Characteristics of Muni Bonds  Types of Muni Bonds  Bond Rating  Muni. FISCAL ACCOUNTABILITY OF STATE GOVERNMENT Presentation Prepared for the Appropriations Committee and the Finance, Revenue, and Bonding Committee by the. Making Cents Clay Community Center September 12, 2013 PAYING FOR COLLEGE.